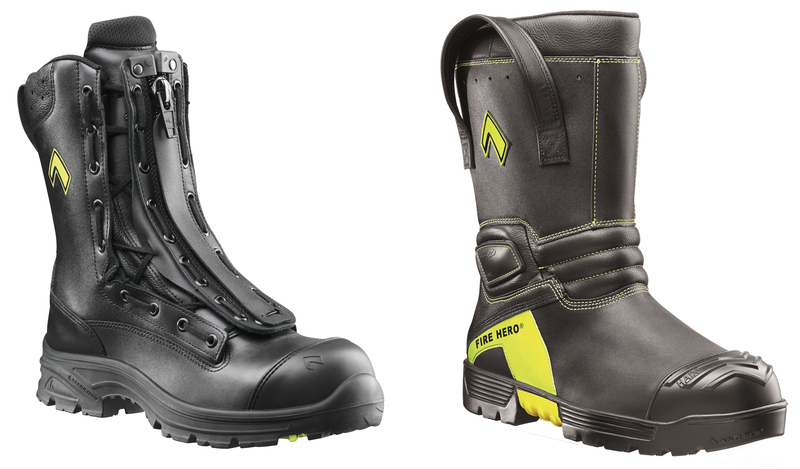 Safety footwear specialist HAIX will showcase additions to its fire boot range for the first time in the UK at The Emergency Services Show 2017, which takes place next week, 20-21 September. The new Fire Eagle Vario, Fire Eagle High and Special Fighter Pro models will be on display, along with products ideal for the rescue and police sectors, such as the sophisticated Airpower XR1. With less than a week until the show opens, here’s a sneak preview of what visitors to the stand can expect to discover. The Fire Eagle Vario and the Fire Eagle High boots feature a lightweight and flexible sports style sole, meaning both models offer durability across sturdy road and rough terrain. The flame-resistant outer soles adhere to the EN 15090:2012 standard and offer excellent resistance to heat, oil and fuels. The boots are also puncture resistant with a steel midsole, preventing penetration from sharp objects. Protective features are enhanced with the ultra-light composite toe caps, made from fibre-reinforced synthetic. This conforms to the highest safety standard ensuring workers are protected from injuries if heavy objects fall on the boots. To withstand a range of strenuous conditions, Fire Eagle boots feature the cutting-edge GORE CROSSTECH® Laminate inner lining, ensuring watertight and breathable qualities with an abrasion-resistant lining, suitable for all weathers. Both designs have moisture absorbent insoles, manufactured with the HAIX Climate System and micro-dry lining, releasing moist air with every step through vent holes at the top of the boot. For quality protection to the foot and ankle, each design is fitted with the HAIX Vario wide fit system; where three different inserts are available, letting workers adjust boots to their foot shape for added support. In addition, the Fire Eagle Vario model has a sturdy ankle protector system integrated with safety protection zones to prevent injury to the ankle. The Fire Eagle High however has an advanced two-zone lacing system for quick and easy lacing adjustment, ideal for emergency situations. Protection and comfort are synonymous with the Special Fighter Pro, a boot created for fire professionals working in extreme environments. With a puncture resistant sole that is flexible and lightweight, wearers are protected when standing on hazardous surfaces. An ultra-light, anatomically shaped composite toe cap also means workers are secure, particularly when carrying heavy loads. Enhancing this protection is the lightweight rubber sole, with anti-slip properties and shock absorption. Adhering to standard EN 15090:2012, the yellow signal marks on the sole are visible through thick smoke. With the GORE-TEX® inner lining, boots are waterproof, breathable and optimised to ensure comfort in all weathers. The moisture absorbing inserts contain antibacterial properties and a separate heel cup, providing ideal cushioning and foot guidance. The HAIX Arch Support System provides ankle support and shock absorption in the arch of the boot, ensuring wearers’ feet will have good foot guidance and proper hold. Support doesn’t stop at the arch as the HAIX lacing system, externally positioned on the shoe, has inner lining crossovers, reducing the danger of hooking and laces becoming stuck. The HAIX Airpower XR1, ideal for rescue and emergency services, offers outstanding comfort and stability. While lightweight and comfortable, the boot is equipped with GORE CROSSTECH® technology, making it waterproof yet breathable, preventing chemicals and other liquids leaking into the shoe. A sophisticated zipping system enables a supportive fit and a cushioning wedge in the sole, reducing stress on the joints, preventing premature fatigue. These boots are designed to provide optimum levels of safety and meets the safety category S3 standard. The boot has oil and petrol resistant sole, all terrain grip and a protective, composite toe cap and a puncture resistant midsole. Delegates at the show will experience how HAIX has truly revolutionised safety footwear. With the new fire boots available to the UK market for the first time, it is clear to see HAIX designers have again applied their unrivalled technical expertise, exceeding safety standards while creating boots with exceptional comfort for emergency services professionals.